What do you get if you cross Tom Ripley, Rain Man's Raymond Babbitt and American Psycho? Well, apparently you get Lou Bloom, an ambitious, manically assiduous character who finds employment as a professional rubber-necker. 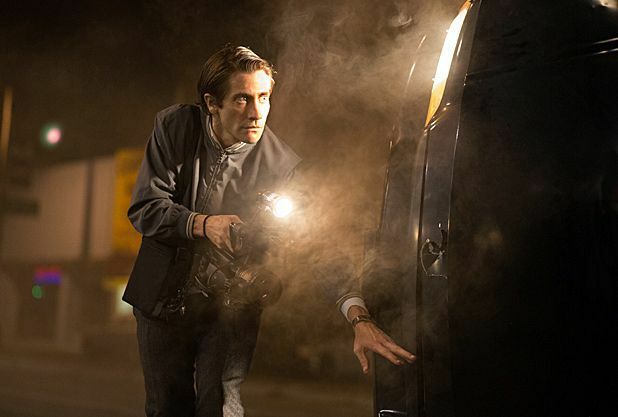 Played by Jake Gyllenhaal, who's literally wide-eyed throughout, Lou finds that his pitiless, amoral personality and ruthless negotiating ability are exactly what it takes to thrive as a freelance cameraman, feeding grisly footage to the LA news scene: a corrupt industry which callously stokes fear in a city of falling crime and that cultivates prejudice with unrepresentative, sensationalist reporting. Rene Russo is the physically glamorous, ethically grubby producer who describes the spirit of her newscast as, 'a screaming woman running down the street with her throat cut,' and Bill Paxton pops up as one of Lou's cretinous peers. Exploitation abounds as human suffering becomes macabre entertainment and Lou takes on an overworked, underpaid assistant (Riz Ahmed) to help with his dirty work. Debut director Dan Gilroy has crafted a characterful satire that doesn't say much that's original but which skewers its targets with humour and flair. An 80s-style soundtrack envelops proceedings in an appositely seedy veil, with ironically fist-pumping musical accompaniments flanking Lou's rise, while an act of violence at the outset leaves a legacy of tension throughout. Gyllenhaal is show-stopping as a man with no filter who spouts self-improvement style dialogue with a staccato, motor-mouthed delivery and who morphs between unintentionally comic, intensely earnest, unnerving and genuinely frightening. This creepy-crawly character is a personification of the cynicism, manipulation and inhumanity currently prevalent in TV news: he's a protagonist apt for our age. Lou (Gyllenhaal) is a young man in LA who finds work as a freelance cameraman, feeding grisly news footage to the sensationalistic networks. A characterful satire of the cynicism, manipulation and inhumanity prevalent in TV news, with showstopping work from Gyllenhaal as the motor-mouthed protagonist.